Preheat oven to 350 degrees F (180 degrees C). Line an 8 x 8-inch pan with parchment paper and lightly grease. In a mixing bowl, beat together the butter and sugar until light and fluffy. Add the flours and salt, continuing to mix until uniform. Press the crust evenly into the prepared pan and bake for 15-20 minutes, or until lightly browned. Set aside. 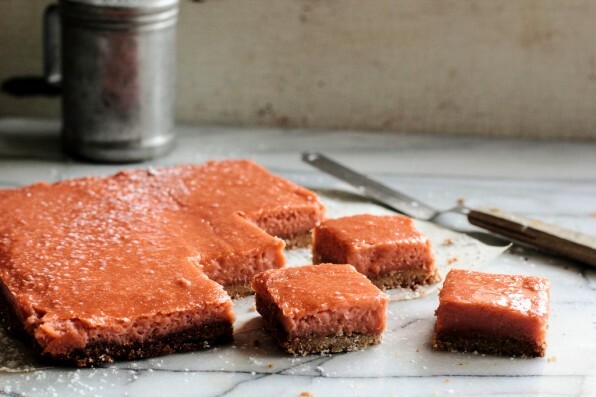 While the crust bakes, place the rhubarb, 3 tablespoons sugar, and ground ginger into a large saucepan. Over medium-high heat, cook the rhubarb until soft, about 10 minutes, stirring occasionally. Cool the rhubarb until lukewarm. In a food processor, place the softened rhubarb and process until smooth. If the rhubarb is more green than pink in color, add a single drop of red food coloring to give the bars a pale pink color. In another mixing bowl, whisk together the eggs, lemon juice, and remaining 3 tablespoons sugar. Gradually add the processed rhubarb and continue whisking until uniform. Whisk in the cornstarch. Lower the oven temperature to 325 degrees (160 degrees C). Pour the filling over the cooked crust and bake for another 25-30 minutes, or until the filling is set and no longer moves when the pan is jiggled. The bars will be easiest to cut after chilled (but there’s no shame in sneaking a few bites when they are warm). Serve warm or chilled, with a dusting of powdered sugar.